I found this book fascinating. I know little about Japanese culture and life, my reading seems to be predominately British, and I enjoyed learning about a people and lifestyle so different from my own. The Makioka Sisters is about just that, four sisters living in Osaka in the years before World War II. The world is changing around them and they are being forced to change with it. Tsuruko is the oldest sister. She is in charge of the main house and all decisions must be submitted to her and her husband. She is clinging to the old world and to the days when Makioka was a name that carried weight and importance. Sachiko is next. Much of the book is told through her eyes. She wants what is best for everyone and slowly comes to realize that what is best might be changing. Yukiko is the third sister and in some ways she is the focus of everyone's attention. She is still unmarried and they all feel a great need to remedy that. While Yukiko is talked of often she always seems to be a distant figure. The reader never gets inside her head and somehow never comes to know her thoughts and her feelings. Yukiko is very much made up of old world Japan. The youngest sister, Taeko, is the most modern. She throws herself into various interests and possible careers, she dresses in the most modern manner, and she falls in love with inappropriate men. The four sisters and their lives all revolve around each other in a complex tangle of hopes, wishes, and emotions. The conflict between the old and new world and the impact the changes have on the family give a clear picture of society in flux. The book was written in an understated and subtle manner that I particularly enjoyed. I found the attitudes and viewpoints of the Japanese culture of the day very interesting, especially the way in which marriages were arranged and how the potential marriage mates were investigated. The author wove so many details into the novel, details about the way of life, attitudes, dress, culture, food, family structure, and Japan itself. Those details made for a complex and addictive writing style. I thoroughly enjoyed sinking into the world that was created. The back cover of the books says that "the story of the Makioka sisters forms what is arguably the greatest Japanese novel of the twentieth century, a poignant yet unsparing portrait of a family-and an entire society-sliding into the abyss of modernity." I am not sure how I feel about the "abyss of modernity" though the more I think about it, the more the phrase grows on me. I do agree with the "poignant yet unsparing portrait of a family." It is that portrait of a family that makes this such a fulfilling book to read. 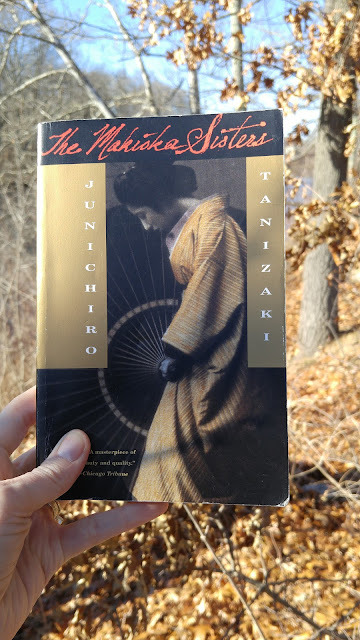 Apparently, The Makioka Sisters was first printed in 1943 but was suppressed by the government because they said "The novel goes on and on detailing the very thing we are supposed to be on guard against during this period of wartime emergency: the soft, effeminate and grossly individualistic lives of women." That's an interesting statement, isn't it? The book was finally published after the end of the war. My dear Jennifer, I cannot believe you said that your "review isn’t anything special" in your comments to my blog. This is an excellent review! If I had never read The Makioka Sisters before, I would have been compelled to pick it up straight away. I'm so glad you enjoyed The Makioka Sisters. I'll let you know if I think of something else you would like! You are so kind! I struggle a bit with writing reviews so your words of encouragement are greatly appreciated. I really did enjoy it. If you do have any other recommendations I would love to hear them.